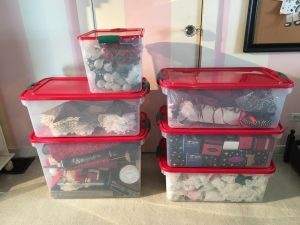 home / Uncategorized / Christmas Has Left The Building! I adore Christmas, I am the gal listening to Holiday music the day it starts full time on the radio! I love the sights, the smells, the sounds and all of the decorations. 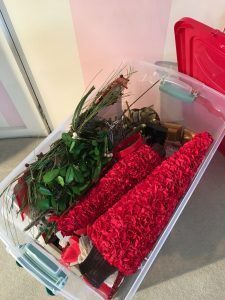 I have a fabulous collection of Christmas decorations and since partnering with Homz Products I decided to treat myself to all new, matching storage! 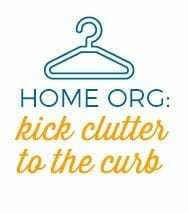 I am so happy with the bins and have devised a plan so getting out all of the bins isn’t a total nightmare! We used to have mismatched bins and never really knew what was where so now I have my collection divided into two main categories; tabletop & hanging and ornaments. 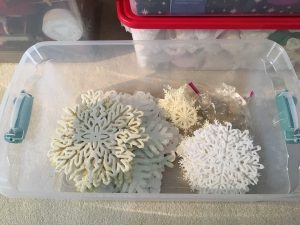 I have most of my tabletop and hanging decorations in the Homz 112qt bins; these allow me to store the decorations that are all different shapes and sizes. 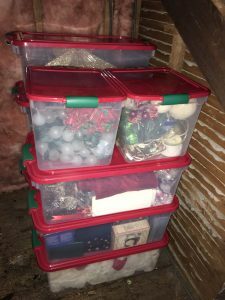 When I get these bins out I pull all of the decorations out and swap out my every day, year round decorations; they get to spend the month in the attic. 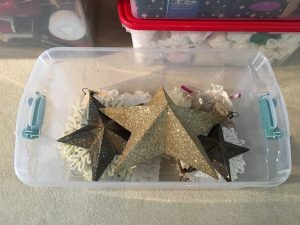 I also have a collection of snowflakes I hang in my windows so these and a few glittered stars also go in a bin, with their mini suction cup hangers, so they don’t get crushed. Then we move onto the tree! 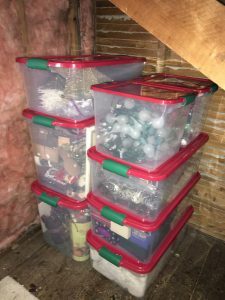 I tend to get tabletop & hanging decorations out before tackling the tree so having them separated makes knowing which bins to get out first much easier. 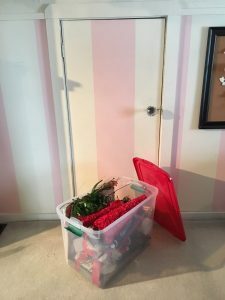 The first bin for the tree holds the tree skirt, the tree topper, beaded garland I put on before any ornaments, a few bags of glittered pinecone garland I hang in my bedroom and a couple of bags of mini ornaments that go on a silver tabletop tree. 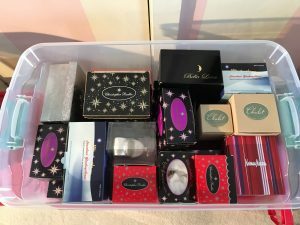 The next bin, 64qt, holds my collection of Christopher Radko and similar ornaments, these are really expensive, super fragile and I store them in their little boxes in the bin for added protection from breakage. These are the first ornaments that we put on the tree because they are bigger and I want them spaced out nicely and to take center stage! 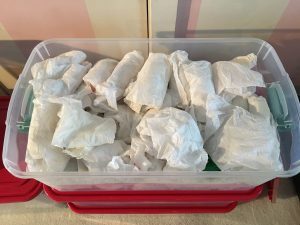 Then we get to the rest of the ornaments, these are individually wrapped in tissue and placed in the 64qt clear latching containers that stack perfectly with the 112qt ones! 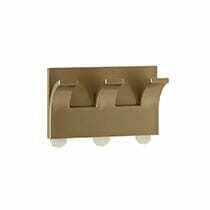 All of the bins are stored in our 1920 attic so the Homz bins are perfect for this. 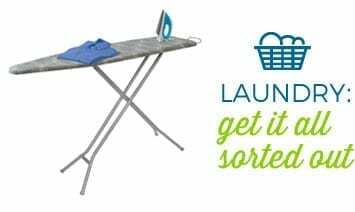 The locking handles ensure the lids stay on tightly, the grooves in the lid allow bins to stack on one another without the worry they’ll slip and the clear bottoms show you exactly what’s inside so you know which bin to grab. The smaller 31qt bin holds delicate strands of lights we use outside and by keeping them in these bins we know they won’t get knocked around and my husband can grab the bin easily when he puts out the garland on our front banisters, this might happen anywhere from a week or even two before I’m ready to decorate inside. 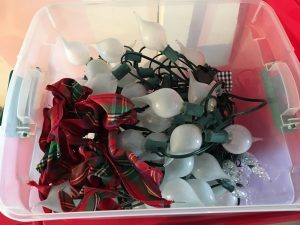 These lights are one of my most favorite decorations and they are super fragile and sadly no longer available so I want to make sure they are as protected as possible. I keep bows I put on my outdoor lanterns with them. While I love Christmas and everything about it I will admit I can only take the visual noise of a fully decked home for about three weeks before I start to get twitchy! I get anxious to put it away and get back to the calm of my year round decorations. 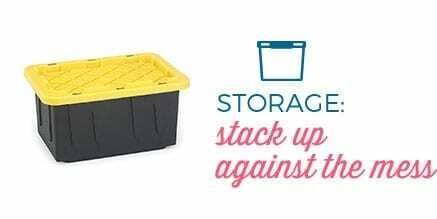 With the Homz storage bins I am able to decorate, and un-decorate, so easily! I am so happy with them and know getting everything out next year will be a cinch.